Microwave Cherry Crunch is a quick and easy recipe for any time of the year. It is a delicious, fruity microwave dessert with only a few ingredients. This Microwave Cherry Crunch is a quick and easy microwave recipe for any time of the year. There are only 4 ingredients and it takes about 5 minutes to throw together and 15 minutes to cook. Start to finish you have a warm dessert to serve in 20 minutes. Does it get any easier than that? It’s especially great in the summer when you want a homestyle dessert without having to heat up the house by turning on the oven. It’s also a great dessert in colder months for when you want something warm and comforting. This Cherry Crunch is similar in taste to a cherry cobbler. You can substitute any fruit pie filling for the cherries if you prefer. It is also good with blueberry, blackberry, raspberry, or apple pie filling. If you’ve never used a “Jiffy” cake mix before, please note that it comes in a smaller size box than a regular cake mix. There are only 1 1/2 cups dry cake mix in a Jiffy cake mix. It is the perfect size for this recipe, or if you only want to make 12 cupcakes or an 8×8 cake. 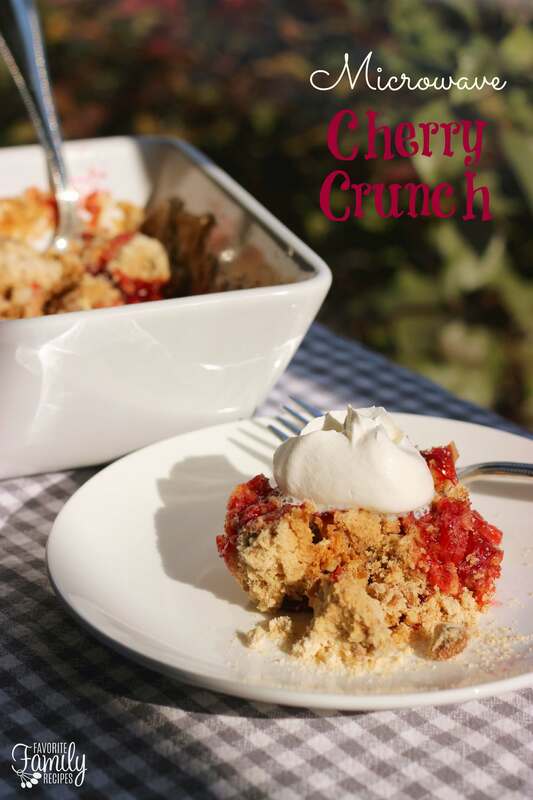 When making this Cherry Crunch, I use a deep 7″ square dish. You can also use a deep dish pie pan, an 8×8 cake pan, or a small casserole dish. Pour cherries in a deep dish pan. In a separate bowl, mix cake mix, cinnamon, and nuts. Spread evenly over cherries. Cut butter into small pieces and place evenly over cake mix. Serve hot with whipping cream or ice cream. That would be great! I hope you like it! This “Cherry Crunch” (dessert) sounds awesome, and also very easy to prepare. In reading this recipe, I assume that we can prepare this dessert by using any flavor of pie filling. I’ll use ‘Apple Pie Filling’ this evening, since that’s what I presently have on hand in my pantry. This dessert sounds very tasty (and versatile) to me, so I’m sure that my family (and I) will enjoy it. Can this dessert be cooked in the oven? Yes, you can bake it in the oven at 350 degrees for about 30-35 minutes. Thanks for asking!